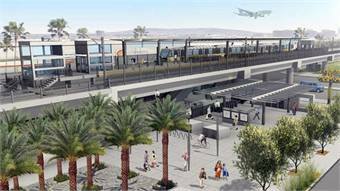 LOS ANGELES — Los Angeles County transportation officials Thursday approved a new train station intended to provide a rail connection to Los Angeles International Airport, capping decades of discussion and complaints over one of Southern California's most infamous planning problems, reported the Los Angeles Times. In a unanimous vote, the county's Metropolitan Transportation Authority board of directors agreed to proceed with further study of a proposed $200-million light-rail station a mile and a half east of LAX's central terminal area. The station would connect Metro's Crenshaw Line, now being built, to a proposed aerial, monorail-like system that will carry passengers to their terminals, according to the report.